ME-TECH 2018 will again be the premier downstream technology event in the Middle East, incorporating high level strategic keynote speeches by end-users and NOCs, macro-economic scene setting overviews from industry experts discussing the future of the industry, interesting and interactive panel discussions on highly topical subjects and technical presentations from technology companies and solution providers. The region’s first Global Aviation and Aerospace Week is set to become a biennial fixture in Abu Dhabi’s calendar of events and will converge six trade events under its umbrella. Abu Dhabi Aviation and Aerospace Week (ADAAW) is anticipated to attract a constellation of decision makers and international experts from the aviation and aerospace industry. MEE is the region’s leading international trade event for the power industry, with dedicated product sectors for power generation, transmission and distribution, lighting, and solar at the co-located Solar Middle East exhibition. Wood Tech & Design Expo offers the wood industry the perfect platform to showcase their products and network with thousands of dedicated buyers. The event will also host the International Wood Conference focusing on innovative design-led wood solutions and a series of free to attend CPD certified workshops. The only dedicated coatings event in the Middle East and Gulf Region for raw materials suppliers and equipment manufacturers for the coatings industry. The Big 5 Heavy is a new, independent and international large-scale exhibition dedicated to the heavy construction industry which will comprise of five focused product sectors – concrete, construction and commercial vehicles, mining and quarrying, foundations and geotechnical and road construction. 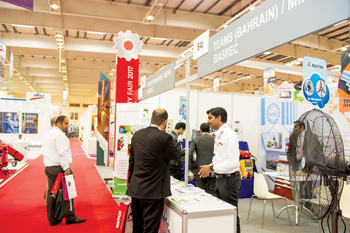 The Middle East and North Africa region’s premier event for covering, flooring and surfaces.